Cairo (Agenzia Fides) - A large representation of the young priests of the Church of Milan began a pilgrimage to Egypt on Monday 25 February, in which also meetings are included with local Churches and visits to places crossed by the so-called "Way of the Holy Family", the itinerary that unites the places crossed according to ancient traditions by Mary, Joseph and Child Jesus when they found refuge in Egypt to escape from Herod's violence. The group of pilgrims includes about 120 Ambrosian priests, accompanied by Archbishop Mario Delpini. During the trip to Egypt, the priests of the Archdiocese of Milan and their Archbishop will also visit monuments and places of historical interest. 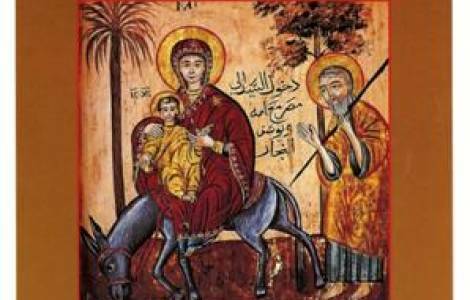 For some time now, as reported by Fides (See Fides 19/9/2018), Egyptian authorities are aiming to promote the Way of the Holy Family, as a pilgrimage route able to involve Christian communities worldwide. On 4 October 2017, Pope Francis, in the context of the general audience on Wednesday, had greeted a large Egyptian delegation who were in Rome to promote the pilgrimages along that route. In February 2017, a few days before Pope Francis's visit to Egypt, Nader Guirguis, member of the Ministerial Commission for the revival of the Way of the Holy Family, in his speech referred to the historical hypotheses based on the Gospel stories, according to which the stay in Egypt of Jesus and of the Holy Family may have lasted for some years.